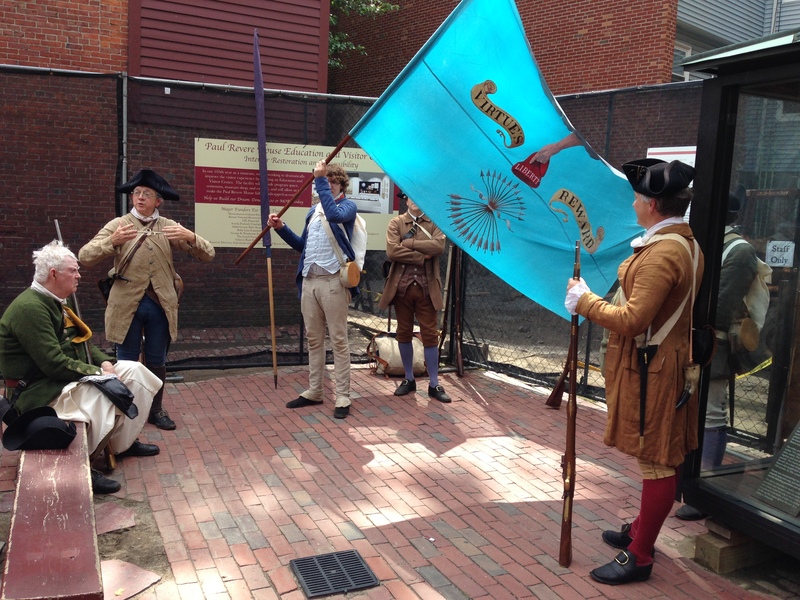 Saturday was my first post-operative foray into costumed interpretation, up to Paul Revere House on Flag Day. This went much better than my first attempt at Paul Revere House, which ended in ignominy as I missed the train. In April, I managed to convince Mr S to drive in Boston, which he usually refuses to do (in fact, he nearly abandoned me once at the Old State House one Saturday after a miserable drive that had us stuck in the Downtown Crossing vortex). I’m so glad we managed this, Despite anticipatory near-tears and epic pouting by the Young Mr, we managed to have a rather nice time. We were in the courtyard, and Mr HC and Mr FC told the story of Amasa Soper’s company and its members several times to the streams of tourists. 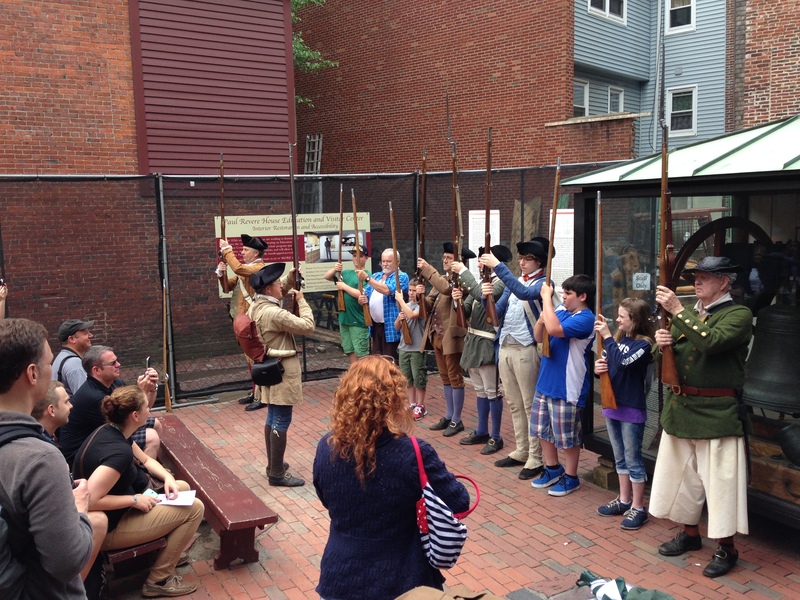 They solicited recruits and ran them through the 1764 drill using the nicest wooden muskets I’ve ever seen, though with mixed results. 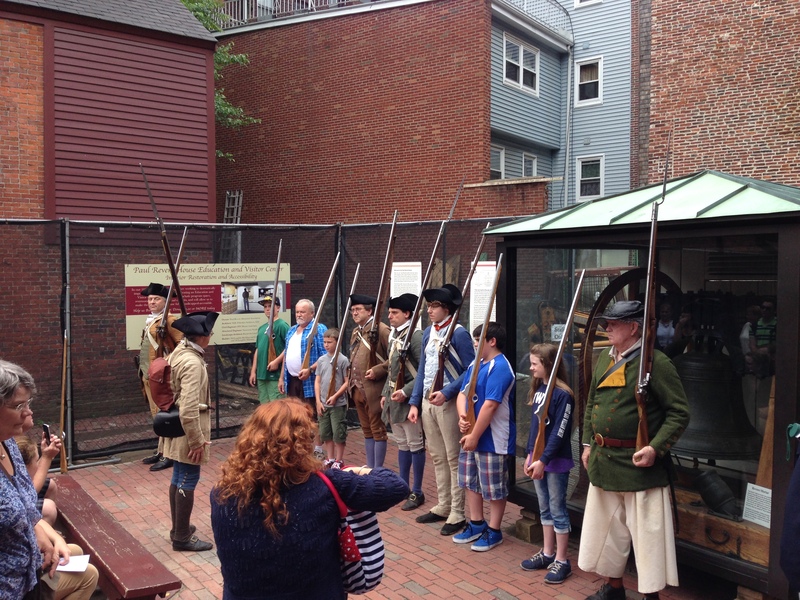 Some new volunteers held their muskets backwards, and the Young Mr’s ramrod got stuck in the barrel, though that is a known issue with that particular musket. I sat on my ladder-back chair near the house and made the tiniest hems I could on Mr S’s next shirt, which will be for best. People asked about the sewing and my clothes, and I had a chance to talk about what women wore, typical fabrics and fibres, supplying the army, and who made what. The day was warm, but fortunately not overwhelming, and as a museum person, I found the crowd quite interesting. This is a facet of Boston I don’t usually see: the tourist experience. In one memorable moment, a pair of young women stood just outside the door to the house. The celebrity factor of Paul Revere is undeniable. There were tourists with guide sheets in Chinese, and tourists who made me wish I still remembered my college German. Some seemed to be hitting every Boston landmark they could in one day, carrying white cardboard pastry boxes; some seemed to be going more slowly, looking, and trying to figure out what they were seeing, and what it meant. What living history means is something I’ve been thinking about lately, or trying to. It’s tangled up with questions of authenticity and appropriateness, but what I learned on Saturday, or re-learned, was how very happy this business makes me. I like history, and historic costume. It doesn’t matter to me if we are talking Revolutionary War or New Republic or Lewis and Clark. Knowing where our country came from is important: so yes, please visit Boston, and Paul Revere House, and Providence and Newport, too! But knowing where you are is just as important. There’s history all around you, and your local historical site, society and museum would love to tell you about it. our history began at that date.